Playtonic's Banjo-Kazooie successor Yooka-Laylee has hit its final Kickstarter stretch goal, unlocking free-of-charge DLC for those who backed the project. 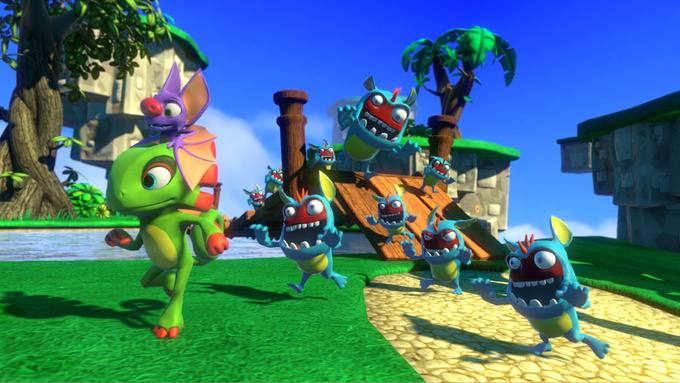 Yooka-Laylee's original target was a modest £175,000, but it quickly smashed through that goal and has been collecting cash at an impressive rate ever since. In case you didn't know, Playtonic is a studio made up of former Rare staffers - hence the intense interest from gamers the world over. The game is confirmed as coming to Wii U.
Yooka-Laylee looks pretty good so far but would be more excited if it wasn't a kickstarter game. You'll be glad to hear there's a kickstarter for Shenmue 3 then! @A01 Actually that announcement soured me on kickstarter. Announcing a kickstarter of a game in a E3 conference is pathetic. @Parasky The game wouldn't exist without crowdfunding. I'll never get the hate for KS. It allows passionate gamers to help bring about games that would never get made otherwise. 3D platformers don't sell, so no big publisher was going to back this without KS. How they had the audacity to beg for money at E3 during the conference of a company as large and rich as Sony, is beyond me. I don't know what they were thinking. The kickstarter has almost reached it's goal already of course. I'm glad the game is coming, but launching kickstarters at E3 really takes the piss. There's broken age, it's out and is a kickstarter game. @Peach64 Playtonic actually had all the funding in place before they even announced the game. The reason they decided to put up a Kickstarter is, because of an overwhelming fan reaction and to make a better, more ambitious game. First Yooka-Laylee, then Bloodstained, and now Shenmue 3 has also reached it's 2,000,000 mark with 31 days to go. What a damn fine year for Kickstarter. I hope all three games are absolutely amazing. I support kickstarter in case of games like Y-L and Bloodstained, but Sony couldn't put up the funding for Shenmue 3? I don't support it, if they want to gauge interest, use a survey or something. With publishers like Sony using it, kickstarter loses all its meaning. Nice, free additional content. Bloodstained and Shenmue also look great, but Yooka-Laylee is the Kickstarter game I'm most interested in, since I love 3D platformers. @Mega719 It should at least be on the XB1, Shenmue 2 was on Xbox. Sega should really consider funding it, along with an HD collection of the other two. @A01 I don't think of it as begging for money as much as utilizing a tool to effectively gauge interest. Sony hears that people want the game, then they wonder if it will really sell. Some in the company think it will, but most think it won't. However, if enough people are willing to pay for it beforehand then they know interest is high enough to justify making the game. @khaosklub Broken Age is not the best example one should take to say that kickstarter games are safe to support. Tim Schafer made a great mess with this kickstarter because he was unable household the budget for this game and needed more money for it. In the end, the game was not what it was planned and a horrible ending was simply squeezed into to finish the game. Really, don't take this game as a good example, take this one: Pier Solar HD. @leo13 Just like with Nintendo, Platinum Games and Bayonetta 2. Guess I'll have to get a next gen console then. Oh well. @leo13 The major problem with that kind of arguement is that they had the gall to ask for $2 mill right off the bat. Yooka-Laylee asked for a tenth of that and release cooler and cooler stretch goals as People donated more and more money. Sony looked at the success of Yooka-Laylee and Bloodstained and went "I wonder how much cash we can milk out of this."